Kudlow Leaks January Payrolls, Says Jobs Report Will Be "Up A Significant Amount"
Well, it now appears that it is Larry Kudlow's job to leak key economic news (especially with the government shut and many of the regular economic reports no longer hitting), because moments ago when speaking on Fox News, the White House economic advisor - whose primary task in recent weeks has been to appear on TV and halt any incipient market selloffs - Kudlow said that the jobs report for January will be “up” and may show “significant” gains based on the amount of (near record low) jobless claims. Why is Kudlow so sure that the report will be solid? Because, according to Eamon Javers, "the furloughed federal workers will be counted in the next jobs number - in the establishment survey", in other words, even those who are expressly not working, will be counted toward the payrolls number. This is taking place with one more week still left in the month of January, suggesting that the BLS is nothing but one giant goalseek spreadsheet operating at the whim of politicians. Kudlow also had some additional comments on the ongoing status of US-China trade talks - which got a dose of cold water this morning on Wilbur Ross' comments that the two sides are "miles and miles" apart, and told Fox News that Trump is optimistic about trade talks with China, and added that "I don't want to be overly optimistic here. I'm just saying, the scope of the talks is huge and the talks are going to continue at the highest level." 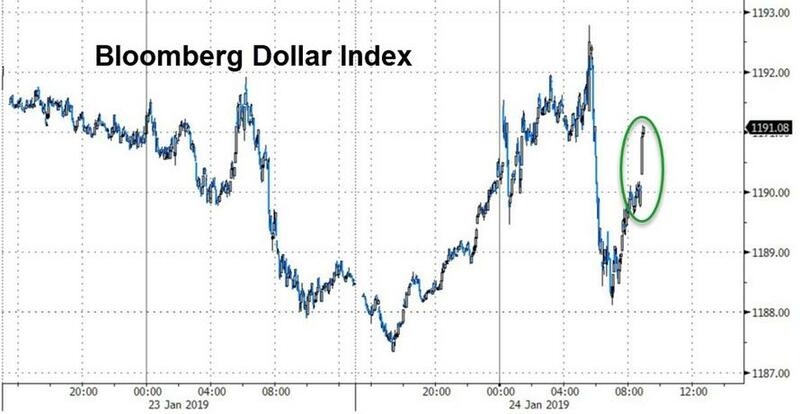 In kneejerk reaction to this managed leak by Kudlow, stocks turned green while the dollar spiked as whispers for another solid 200K+ jobs report spread across the trading community.